The Big Bopper slot is about Jiles Perry “J. 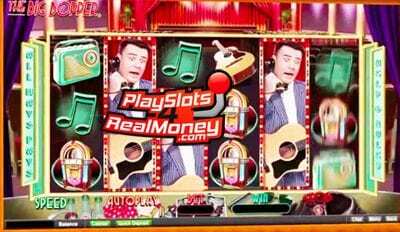 P.” Richardson, Jr and has some amazing graphics with the Big Bopper playing guitar in this 1950’s rock n roll themed video slot machine that powers Real Time Gaming (RTG) software. You can spin the reels playing this brand new progressive jackpot slot machine for real money or Bitcoin until the day music died. This game features authentic vintage footage of Buddy Holly and Jiles Perry “J. P.” Richardson, Jr plus offers some great ways to win like the two different free spin bonus rounds and instant wins bonuses. The symbols that you will see on the reels are indicative of the 1950’s rock n roll era when Buddy Holly and Jiles Perry “J. P.” Richardson, Jr was on the radio. There are also traditional playing card icons. You will also see some very cool rock and roll icons like the Wurlitzer jukebox, an old transistor radio and the printed 12” vinyl records. RTG will soon release ‘The Big Bopper,’ a brand new 6 Reel Video Slot coming to Slotocash and Uptown Aces April 13th. ‘Hello, ba aaa aaby! Hit the dance floor with this hip-swinging, toe-tapping new slot from Real Time Gaming, branded with classic tracks and fun footage from none other than The Big Bopper® himself! In ‘Chantilly Lace Free Games,’ more and more free games are won as long as the Big Bopper® sings, with the potential to score up to 45 Free Games with x10 pays! Finally, the ‘White Lightning Free Games’ continue for as long as the music is playing, with a grouped top-paying White Lightning symbol added for some huge wins! Unfortunately, Jiles Perry “J. P.” Richardson Jr. passed away on February 3, 1959, after a plane crash. This plane crashed in Clear Lake in Iowa. Jiles Perry “J. P.” Richardson Jr. was on a flight with his friends and fellow music stars Buddy Holly and Ritchie Valens. Music fans referred to the day of the plane crash as “The Day the Music Died”.